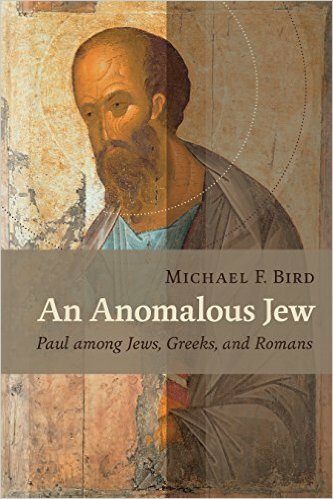 An Anomalous Jew, Michael F. Bird’s newly published addition to the field of Pauline scholarship, begins with the obvious: the Apostle Paul was a Jew. Paul was born into a Jewish family and spent his early years studying the Torah. As he grew older, he became a Pharisee, and according to both Luke’s description in Acts and Paul’s own words in Galatians, he worked actively to eradicate the young Christian movement before himself becoming a follower of Jesus. In the introduction, Bird draws attention to the fact that, even as a Christ-believer working among the Gentiles, Paul expressed concern for his “kindred according to the flesh” (Rom. 9:3, NRSV) and affirmed the value of Israel’s election and covenants (p.2). In sum, the man was deeply Jewish. What makes the issue complicated, though, is that Paul also said some things that, as Bird puts it, “no Torah-affirming Jew could seemingly say” (p.3). In the face of these tensions, Bird explains that Pauline interpreters are faced with some important questions: “Where in Judaism should we situate Paul? What kind of Jew was he? And how did he relate to contemporary Judaism as a Christ-believing Jew?” (p.8). Answering these sorts of questions is a daunting task to be sure, but Bird energetically takes them on. So, what should we call Paul? For some, like J. Louis Martyn and Love Sechrest, he is best described as “a former Jew” (pp.10-12). On the far other end of the spectrum, Mark Nanos and Pamela Eisenbaum would insist on calling Paul “a faithful Jew” (pp.22-23). Somewhere between these two extremes sits the category of “a transformed Jew,” which for Bird encompasses much of the work done by proponents of the “New Perspective on Paul” (NPP), authors like N.T. Wright and James Dunn (pp.12-19). The rest of the book puts flesh on the bones of this characterization by looking at a few anomalous aspects of Paul’s life and thought. There are chapters devoted to the meaning of salvation for Paul in relation to the rest of 2nd Temple Judaism, the nature of Paul’s apostolic mission to the Gentiles, and his posture towards the Roman Empire (p.29). Bird also wades into more contemporary debates about salvation-history vs. apocalypticism in Galatians, which allows him to critique some modern renderings of the “Apocalyptic Paul” and suggest that salvation-history and apocalyptic don’t necessarily have to be held in stark opposition to one another. Though we will unfortunately be unable to explore all of these topics in full detail, I hope that some valuable things can be learned by delving into a few of them. Traditional Protestant interpreters of Paul often see in his letters a deep and passionate critique of a Judaism that is legalistic and centered on works-righteousness. Bird points out that this type of reading reached its climax with the writings of Wilhelm Bousset in the 19th century and people like Strack-Billerbeck in the 20th century (p.32). For Bird, this conception of a purely legalistic Judaism is inadequate. He writes, “It is not hard to trace statements that strikingly emphasize God’s mercy and election of Israel, expressed chiefly in the covenant, as the efficacious force in salvation” (p.33). The NPP rose to prominence (partly) in reaction to legalistic portrayals of Judaism. E.P. Sanders set the agenda in Paul and Palestinian Judaism with his portrayal of Palestinian Judaism as “covenantal nomism,” which Bird summarizes with the dictum “grace to get in and works to stay in,” though the obedience that maintains one’s position in the covenant is itself often seen as a response to the prior grace of God (p.37). In the years since the publication of Sanders’ book, responses to it—both positive and negative—have been many. One of the more legitimate criticisms is that Sanders overly-minimized the diversity of soteriological patterns in Palestinian Judaism in order to fit them all in the category of “covenantal nomism” (pp.37-39). Not all Jewish texts dealt with the dynamics of grace, covenant, and works in the same way. For Bird, there is “no single Jewish soteriology,” which means that it is “impossible to compress all narrations of the basis, agency, and scope of salvation in Judaism into a single esoteric descriptor like covenantal nomism” (p.38). This is a point where I especially wish Bird had been able to engage with Barclay’s massive Paul and the Gift, especially since the term “an anomalous Jew” comes from Barclay’s writings. In Paul and the Gift, Barclay delves into the various dimensions (“perfections”) of grace. He nuances Sanders’ arguments by asserting that, “Grace is everywhere in Second Temple Judaism but not everywhere the same” (Paul and the Gift, p.6). Barclay goes on to argue that while Sanders looked mainly for evidence regarding Jewish belief in the priority of grace, Paul was relatively unique among Jewish writers in that he perfected the incongruity of grace (Paul and the Gift, p.320). Barclay’s taxonomy of grace is an elegant tool for helping scholars try to better discern how Paul resembled and differed from other voices in 2nd Temple Judaism, rather than merely demonstrating that he did. What makes Paul “anomalous” for Bird when it comes to salvation and Judaism? Among other things, he believes that Paul demonstrates an uncommonly “strong anthropological pessimism” (p.41). Paul possessed a radical understanding of the severity of humanity’s plight, which led him to criticize the Law for being unable to deliver Israel and humanity from sin. Additionally, Paul portrayed the Torah as being (in some ways) temporary rather than eternal. Paul critiqued other forms of Judaism for looking “the Torah rather than to the Messiah for the revelation of God’s righteousness, for the reconciliation of the world, and for the renewal of creation” (p.68). Additionally, Bird suggests that Paul relativized the importance of his Jewish ethnic identity in light of Christ’s life, death, and resurrection (and the positioning of believers as “in Christ”) (p.53). Apostle to the Gentiles and Jews? Another topic addressed by Bird in An Anomalous Jew is the nature of Paul’s mission to spread the gospel among the nations. Paul is well-known as the “Apostle to the Gentiles.” However, Bird argues against the idea that Paul ever explicitly turned away from preaching the gospel to Jews when the chance arose. He characterizes the division of labor between Paul and Peter in Gal. 2:9 as being about “emphases rather than strict boundaries” (p.102). This is consistent with the earlier opinion of Martin Hengel that “It was never possible to draw a neat division between mission to the Gentiles and mission to the Jews in the church” (The Four Gospels and the One Gospel of Jesus Christ, p.154). So, in summary, what is Bird saying here? He isn’t saying that Paul was “apostle to the Jews” in the same way that Peter was. Rather, he is asserting that “While doors opened up among the Gentiles, they were never closed to the Jews” (p.104). And this, Paul’s continued openness to preaching to fellow Jews, even as he tried to insulate his Gentile converts from pressures to judaize, formed another anomalous aspect of Paul’s identity. In the book’s final chapter, Bird explores Paul’s relationship to the Roman Empire. Was the Apostle a strident anti-imperial activist? Or did he find the Roman political realm basically uninteresting? N.T. Wright, for instance, declares that “for Paul, Jesus is Lord and Caesar is not” (Paul: In Fresh Perspective, p.69). Seeing an anti-imperial dimension to Paul’s identity is plausible to Bird for a number of reasons. For one thing, Paul sometimes uses theological language that echoes rhetoric used throughout the Greco-Roman world to proclaim the success and triumph of the emperor (p.229). While Bird maintains that “Paul’s principle source for his theologizing is the Septuagint and Christian traditions,” he nevertheless thinks that Paul uses this language to tacitly critique the totalizing claims of Rome. Alongside a number of other recent works, Bird’s careful and imaginative efforts here represent what I think may be a real step towards getting past the scholarly stalemates that have occurred in Pauline studies over recent years. Reading through the book’s pages, one can notice a real amount of influence by N.T. Wright—which is no bad thing. Bird is willing to criticize the excesses of scholars on both sides of the scholarly pendulum. It’s a shame that he was unable engage deeply with Barclay’s Paul and the Gift, but I think this book will nevertheless help spur on the ongoing discussion about the shape of Paul’s admittedly complex identity. It’s a sometimes dense, but very worthwhile read. Disclosure: I received this book free from Wm. B. Eerdmans Publishing Co. for review purposes. The opinions I have expressed are my own, and I was not required to write a positive review. This entry was posted in Book Reviews and tagged Book Reviews, E.P. Sanders, Galatians, Grace, John Barclay, Justification, Michael F. Bird, N.T. Wright, Paul, theology by joecrow91. Bookmark the permalink. Thank you for the review. Currently this is my area of study so helpful and I will look out for the book. Thank you! If you don’t mind my asking, what are some other books on this area that you’ve really found insightful?